ACCORDING to the World Health Organization, key causes of hunger are natural disasters, conflict, poverty, poor agricultural infrastructure and over-exploitation of the environment. I would add to that list spending a week in the high desert of Arizona with Discovery Channel’s Dual Survivor star Cody “Barefoot” Lundin. Billed as no ordinary weeklong survival course, Cody’s Desert Drifter is designed to “strip you of everything you thought you needed in the wilderness.” And in my case, that also meant missing the fine print on the course paperwork I filled out to join this wandering band that would have allowed me a small bag of GORP (granola, oats, raisins, and peanuts) to tide me over as we chased crickets and rabbits for food in northern Arizona. Hunger set in early for me. As hungry as I was in those first days of calorie burning hikes in extreme temperatures and rough terrain, and an all night march in near freezing temps (shivering burns a large amount of calories), I was faintly comforted by the knowledge that the progressive effects of heat and hypothermia were more likely to kill me than my hunger pangs. With no blankets and a strict “no fire” rule in those first few days, I was left to snippets of communal body heat when we kind of slept and what nourishment I could forage from a landscape that moved quickly under our feet. We were a tribe of nine, drifting now, and the do more with less mantra of the Aboriginal Living Skills School, founded by our barefooted leader, began to sink in. After 48 hours of one extreme survival scenario after another and no sleep, I really began appreciating fine print as my body sucked energy stored from my adipose tissue (aka body fat) and began sipping my strategic energy reserves of glycogen from my liver. My system was struggling to feed my brain and its ability to execute the simplest of cognitive tasks – like putting one foot in front of the other, and completing Cody’s primitive skills modules, which also required the dual survival skill of channeling my ancestors with one side of my starved brain and calling up my genetically coded ability to complete fine motor skills with the other. Just another day in the life of our ancient genome, but a rude awakening to a system accustomed to quick energy inputs from a modern nutritional landscape dotted with Chipotle’s and 24-hour Circle K’s. The course was designed to beat you down, and beat you down it did. But the one thing that helped me through those first few days – and the remainder of the weeklong survival course for that matter – was my understanding of the ancient bioreactor deep in my gut. Nearly five feet in length, the human colon and its trillions of resident bacteria have the ability to generate calories from almost any plant matter no matter how nutrient-poor that matter may be. Like the fermentation that takes place in the various stomach chambers of cows, goats etc., the gut bacteria breaks down undigested plant material through various processes and produce byproducts such as short chain fatty acids, which are then absorbed into the body and utilized by the muscles and organs as energy. Depending on the type of undigested plant material (e.g., resistant starch, cellulose, hemicelluloses, inulin, pectins [aka dietary fiber]), the gut bacteria can convert 1 gram of plant matter into as much as 1 to 1.5 calories. Not bad when you consider the straight-up digestible carbohydrates available, say, in a slice of bread, converts as 1 gram ingested to 4 calories. In other words, bacteria are the reason horses, cows, deer and similar critters can extract enough calories from blades of grass. So throughout those first few days I literally grazed as we whisked along, grabbing handfuls of green grass, wild flowers, not so tasty berries, and anything that I could choke down. These handfuls of green matter were broken down by my commensal bacteria and turned into calories. Though it was difficult to calculate, I probably generated 300-400 much-needed calories a day from my new trail diet (but likely burned 6-10,000 calories a day). In order to generate even a modest 1,500 to 2,000 calories from the trail diet, I would have had to literally chew all day, and probably locate more energy dense plants (e.g., root foods) that also contained some straight up carbohydrates and starches. We did eventually eat our way into some nutritious stands of cattails – once Cody allowed us the comfort of fire days into the Desert Drifting to cook them.As with other plant eaters, our early ancestors relied on gut bioreactors to extract calories from otherwise undigested foods. While our colons make up a smaller percentage of our overall gut system today, our ancestors relied on the colonic bioreactor to generate calories from twigs, leaves, flowering plant parts and so on – similar to our tree swinging cousins. But as the quality of our diet improved – through technology and ultimately the advent of fire – the requirement of our bioreactor decreased and therefore its overall size. Even though our colons and their bioreactor function remain a significant part of our gut systems, our modern diet hardly delivers the fermentation products down the pipe as it once did – as I experienced during my week of foraging across the landscape. And there-in lies possibly the biggest unappreciated health crisis facing our modern society today. 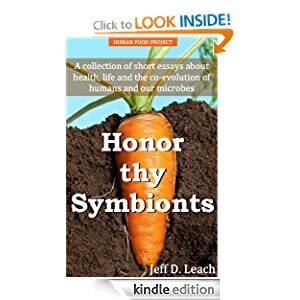 With a reduction in the consumption of undigested plant parts – to say nothing of the reduction in diversity of plants – we have literally stopped using the calorie-generating bioreactors handed down to us by our ancestors, and in the process created an imbalance in our microbiota that evolved within our gut ecosystem. By not receiving a steady supply and diversity of plant parts (again, fiber), the bacteria living in our guts cannot do their evolutionary job and fight off invading pathogens by increasing acidity, and therefore compete for nutrients and niches in order to flourish along the colonic wall. The existence of residential microbiota is ancient, providing evidence of the co-evolution of bacteria and animals. In the case of humans, we are endowed with a “specific” set of bacteria at birth and our life history pushes and pulls that balance on a daily basis. Though there is poorly defined variation among human populations, there exists a genome-specific set of players that are significantly influenced by diet. Rapid changes in diet in our post-modern era are predictably producing different diseases. In short, changes in human ecology equals changes in our microbiota. Add to this the astonishing increases in Caesarean sections that limit perinatal transfer of maternal microflora, which is further confounded by the replacement of mother’s milks with formula – which creates an imbalance in natural, indigenous flora. Advances in molecular and genomic techniques confirm the role of infection in an increasing number of acute and chronic diseases, made more likely by diet and lifestyle-induced imbalance. Disease was heavy on my mind as I drug my weakened body from one cattle tank to another to scoop stagnant, muddied and often dead animal-laden water. But unlike my GORP-eating fine-print-reading colleagues, my steady but limited diet of grass blades and flowers meant my microbiota was bolstered for anything that may have slipped past the iodine drops. While the biggest threat I faced was diarrhea from bad water, I wouldn’t have experienced the impact for a day – or even longer – as I wouldn’t have experienced any symptoms at the time of consumption. In fact, the connection between “dirty” water and diarrhea was not made until the 1800s. This same delay from infection to symptom is what delayed acceptance of infectious causation of other vector-borne diseases such as malaria – transmitted by mosquitoes. But what if many of the chronic diseases plaguing us today, like heart disease, breast cancer, colon cancer, diabetes and Alzheimer’s, all in fact could be ascribed to infectious causation? What if these terrible diseases had a more acute phase, would we then recognize them as the result of infection? Is the lag time between infection and manifestation that characterizes a particular chronic disease shifting our medical attention away from the obvious? I think medical professionals who ignore infectious causation of many of the big chronic killers today will look as myopic to medical historians in 20-30 years from now as the researchers who dismissed infectious causation for pneumonia, chicken pox, and diarrhea did not that long ago. As we rounded out our desert drifter week we did finally get to enjoy some freshly gathered crawfish from the Verde River along with some crispy grasshoppers roasted on a stick. This was made all the more enjoyable by the fact that I, and everything I ate, was covered in dirt teaming with natural microorganisms that my ancestors had long ago forged a symbiotic relationship with. Dirt is good. Cody, you the man. I never felt so alive. Peace. Alert me when more articles like this are posted. And updates on the Human Food Project. I’m in the Army, and just got on the overweight program again. I love physical training, but also love food and beer. I would definitely do this challenge if ever given the opporutinity. I would love to ask Jeff what he thinks of eating backyard grass. Not as an energy source but as a very fast simple means to get fiber into the body.